There is something that feels literally magical about the start of blood orange season. A few weeks after the excitement of Christmas and New Year’s has died, when we’ve glumly settled into the January doldrums, being beset by cold toes precludes us from wearing anything but big clumpy shoes, and slushy snow feels rather less than miraculous, the blood oranges suddenly … appear. There they are at the greengrocer’s, putting clementines, humdrum navel oranges and even Sevilla oranges to shame. They’re like visitors from a superior planet. Blood oranges would be irresistible even if they weren’t so glorious-looking, but slicing open a blood orange to reveal its saturated pomegranate-red flesh gives me an almost voyeuristic thrill. So beautiful, so delicious. This year, like last, I threw my own birthday party (I highly recommend it; you get exactly the party you want) and by all measures, it was a success, with lots of wonderful food that I’ll be blogging over the next few weeks. This dark chocolate and blood orange cake was my birthday cake, which is why in the photos it’s looking a bit the worse for wear. (None of us would look our best after spending a night in the fridge covered with aluminium foil.) I love this cake. It is dense, moist, and fudgy, deeply orange-y, and boozy. There are five chopped blood oranges in the cake, the flavor of which as they’re baked becomes concentrated and almost alcoholic, like the cherries in black forest cake. I normally am not a fan of self-rising flour, as I don’t think it actually rises all that well, but in this case that density really works. In the UK, I find that it is almost impossible to locate really good quality unsweetened cocoa powder for baking. (And Dutch processed? Forget about it.) So I used Whittard 70% dark chocolate drinking cocoa. I phoned Whittard today to find out how much sugar the cocoa contains, and was told that the powder is 31.2% sugar. I’ve adjusted the quantities below to reflect that percentage (i.e., the quantities are for unsweetened cocoa powder), but either way I recommend you use high-quality cocoa with a high cocoa percentage. I drizzled the individual layers with Cointreau, but that’s strictly optional. Since this was a birthday cake, I covered it in a ganache so I could write “Happy Birthday to ME” on it, but if I made the cake again, I’d cover the whole thing in frosting since the slightly orange-y frosting was such a lovely contrast. I made an Italian meringue buttercream frosting (recipe follows) which is lighter and fluffier than Swiss meringue buttercream. If you want something richer and thicker and more substantial, here is a link to a Swiss meringue buttercream recipe. Or you can dispense with frosting altogether, bake this in a square pan, and serve it with crème Anglaise. Finally, one of my friends very sweetly told me that he would have liked my cake even better if there were lots and lots of frosting between the layers. Yes, I was a little stingy. Don’t make the same mistake. Preheat your oven to 350 degrees Fahrenheit (180 degrees Celsius). Use an oven thermometer if necessary to ensure accuracy. Line the base of a springform 9.5 inch x 2.5 inch cake pan (or two cake pans) with baking parchment or silicone baking paper, and then grease the pan and parchment with butter. 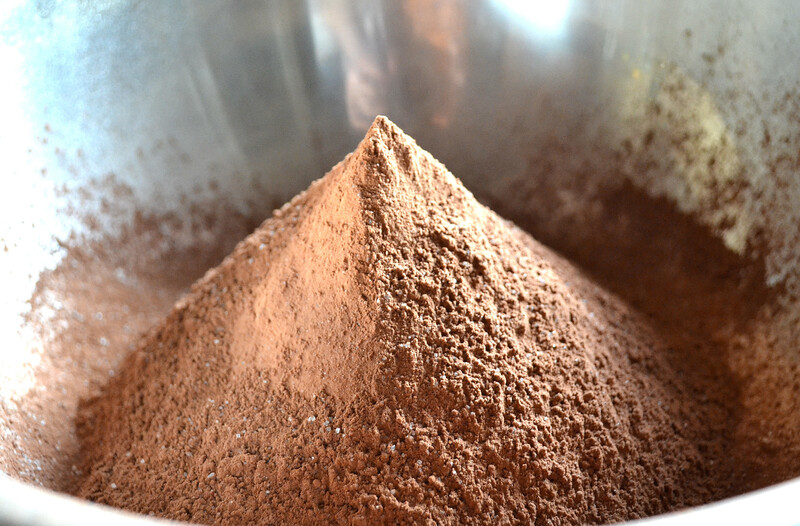 Combine the flour, cocoa, and salt in a mixing bowl. In another bowl, cream together the butter, sugar, zest, and vanilla extract until fluffy. Add the eggs one by one, beating thoroughly after each until it is fully incorporated. 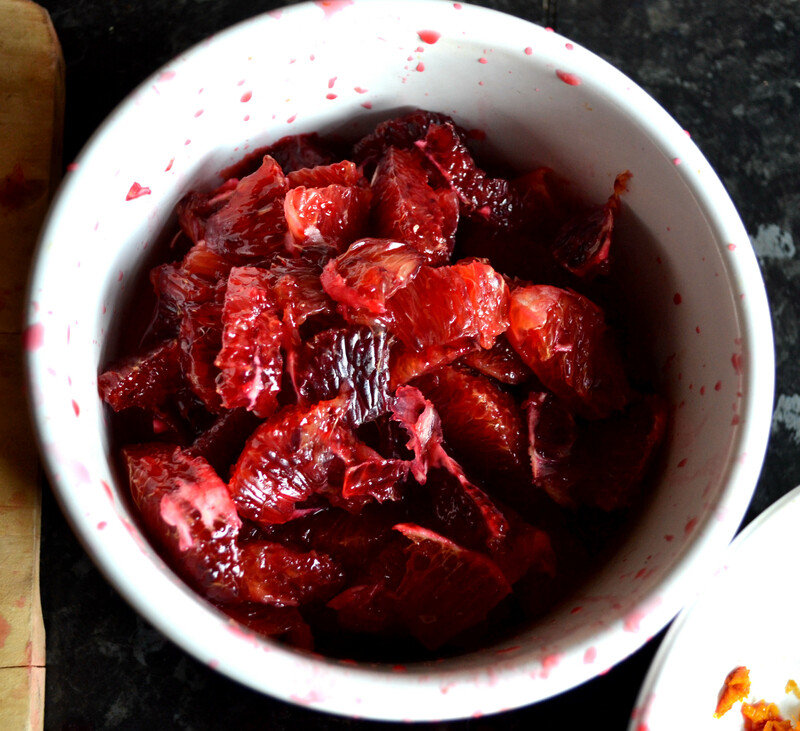 Fold this fluffy mixture into your dry ingredients until fully mixed, then fold in the blood orange pieces and reserved juice. Spread this batter in your prepared cake pan(s) and bake in the center of your oven until the interior of the cake registers 205 degrees Fahrenheit (96.1 degrees Celsius) on a thermometer. (I find this to be more reliable than jabbing your cake with a wooden stick.) Baking the cake in a 9 and a half inch pan took me nearly an hour and a half; divided between two pans I expect it would be more like 50 minutes. Transfer cake to a wire rack and let cool for about 10 minutes, then loosen the sides of the springform pan and let cool completely. Combine 200 grams (1 cup) of the sugar in a heavy-bottomed saucepan with ½ cup water, and heat over medium heat, without stirring. You can swirl the pan occasionally to catch any crystals that may adhere to the edge. You want to heat the sugar to 245 degrees Fahrenheit (118 degrees Celsius). It is much easier to do this with a candy thermometer, but you can also heat the syrup until a bit dropped in some cold water forms firm balls. This takes nerves of steel. While the sugar syrup is heating, start beating the egg whites in a clean stainless steel bowl. When they’ve become creamy add the remaining 50 grams (1/4 cup) sugar and continue beating until the egg whites are stiff. When your sugar syrup has reached the desired temperature, turn the speed on your beaters to high and drizzle the syrup in a thin stream against the side of the bowl (not directly into the egg whites, if you don’t want to cook the egg whites and ruin your frosting). Continue beating until the bowl is completely cool to the touch, about 10-15 minutes. Your egg whites will be very stiff and glossy. When your egg whites are completely cool (again, don’t rush this or your butter will melt and your frosting will collapse), beat in the butter one piece at a time until it is completely incorporated and you have a thick, luscious, creamy frosting. This lovely blog post here has a great pictorial guide on making Italian meringue buttercream, and I used her proportions. Drizzle in the blood orange juice, beating all the while. To frost your cake, cut the cake carefully with a bread knife into layers and place onto a board covered with parchment paper. Drizzle each layer with 1-2 tablespoons of Cointreau. Frost generously between the layers using a rubber spatula or palette knife, and then frost the top and sides. If you use the bottom of the cake as your top layer you’ll have a nice smooth surface. Transfer to a clean plate when done. 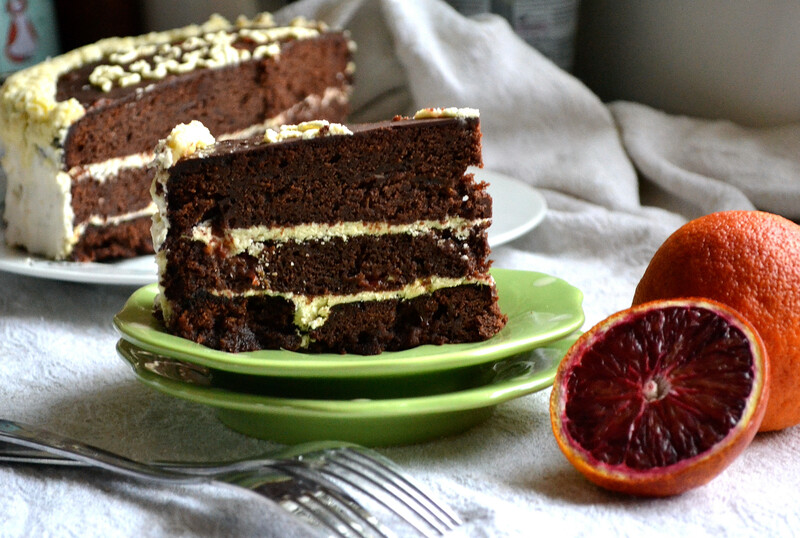 This lovely fudgy orange-y layer cake is rich enough to feed 15-20 people at least. This entry was posted in Desserts and Sweets, Recipes and tagged Baking, blood orange, booze, Cake, Chocolate, dessert by Susan. Bookmark the permalink. I’m not much of a cake fan, Susan, but I might try this once blood oranges come in — it looks dark and irresistible. All good things for a cake! Oh wow. I will have to try this, it looks amazing! P.S. Happy Birthday to you! May I come to dinner? Or at least just for dessert? That cake looks absolutely wonderful! And I love the “visitors from a superior planet” description. You’re right: citrus in general, and blood oranges specifically, are about the only things that makes winter bearable. Wow! So many things I love about this: blood oranges, the fact that this cake looks DENSE and Italian Meringue buttercream. I ate sooo many blood oranges when I lived in Italy! So much better than a regular orange! I looooove Italian Meringue Buttercream, because it’s so fun to make! YouTube taught me how (this video particularly: http://www.youtube.com/watch?v=IxWmiHRTMz8). The only difference is I pour my sugar syrup directly onto the meringe (not on the side of the bowl) and it turns out fine. Thank you Tania! You’re such a wonderful baker, but you also have such a wealth of lovely tropical fruits in Oz. This sound amazing! Can’t wait to try it. Thanks Sara, and thanks so much for subscribing! Do let me know what you think if you do try it. Uhm blood orange and dark chocolate, is there a better pair?! I knew it!! OK maybe raspberries with white chocolate? hm, when is that one coming?? Oh, that would also be great in a gallette!! Fabulous tip! Thank you! Odd that they don’t widely advertise that. I’ve seen the G&B cocoa powder, but don’t buy it because the Dutch process isn’t featured on the packaging. Happy Birthday Susan! Time sure does fly. Yummy-Got to try this. that blown-up photo of that cake in the header looks bloody obscene. Happy Birthday! That cake alone is reason enough to celebrate. 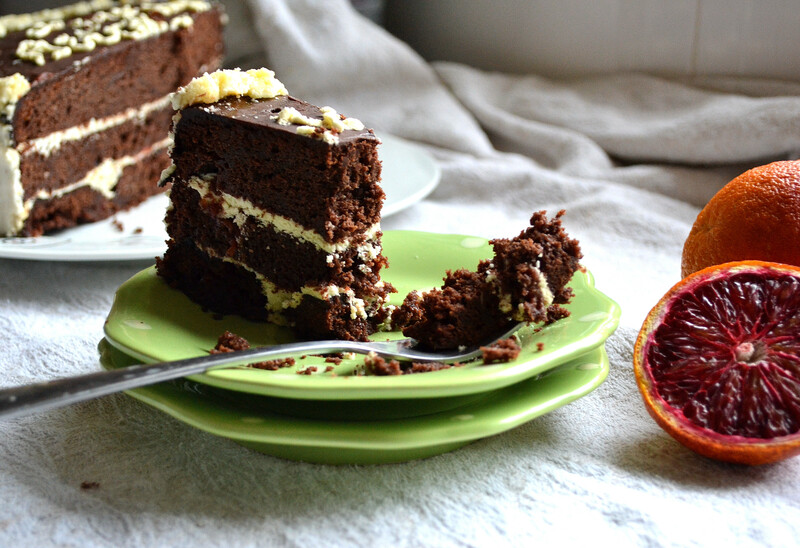 This cake looks absolutely gorgeous – rich and moist and chocolaty and full of orange flavour…perfect for a birthday! 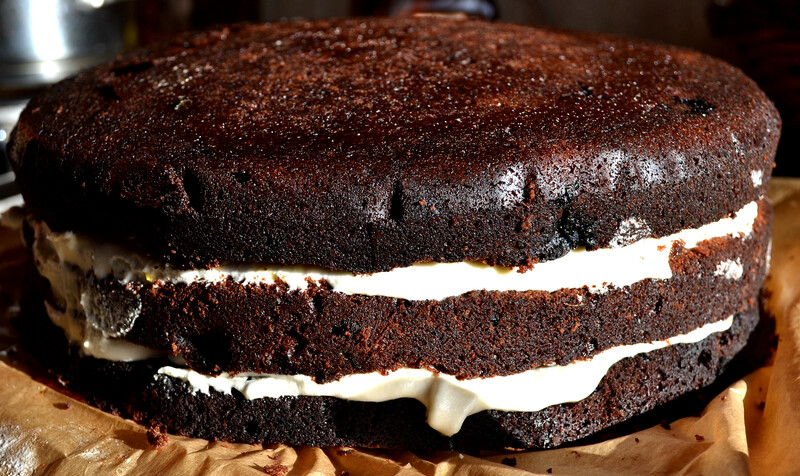 I use Green & Blacks cocoa powder and find it gives a pretty good flavour – have you tried that?